The sports world is mourning the passing of two notable athletes this weekend—golfer Arnold Palmer and baseball pitcher Jose Fernandez. Palmer was 87 when he died in a Pittsburgh hospital. The cause of death is not yet being reported. Palmer is considered one of the greatest golfers of all time. He emerged as a superstar when golf was gaining popularity as a televised sport. His hard-charging style of play won him a large following, and he will be greatly missed by all who appreciated his talent and what he did for the game of golf. Hernandez was only 24 when he and 2 others died in a boating accident off the coast of Miami. 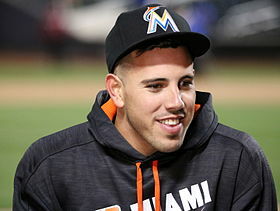 Jose defected from Cuba as a teenager, and became the National League rookie of the year in 2013. Besides his great talent as a pitcher, Jose will be remembered for his positive attitude and his joyful passion for the game. His death came as a shock, and those who knew him are struggling to come to grips with his passing. Two notable deaths in the sports world—one man 87; the other 24. Just another reminder that we all have an appointment with death. We just don’t know when that appointment might take place. The point is, we all need to be ready. “What I say to you, I say to everyone: ‘Watch!’”—Mark 13:37. This entry was posted in Christian Living, Communion Meditations, Current Events, Sports and tagged Arnold Palmer, death, illustration, Jose Fernandez, Mark 13:37, ready for eternity. Bookmark the permalink.